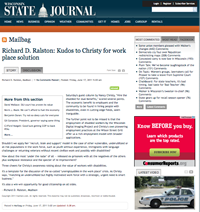 Wisconsin should be proud of an innovative project to help employ people with disabilities in a cutting-edge field. The Wisconsin Department of Health Services and the Pathways to Independence program have launched a project to recruit, train and support individuals with disabilities in the field of document transfer and storage preparation. Based on a Minnesota model that has led to job creation and business opportunities for hundreds of individuals with significant disabilities throughout Minnesota, the Wisconsin Digital Imaging Project aims to meet the digital transfer needs of private businesses, health care providers, schools and local governments. Those needs are ever-increasing. The transfer of records from paper to digital files is a must in today’s world. This essential business practice can be labor intensive and costly. Some companies are off-shoring many aspects of the job, thereby missing a golden opportunity to benefit both their bottom lines and their communities. The human capital these companies need is right here at home: People with disabilities offer a willing, eager and desirable work force. Wisconsin Technology Council President Tom Still sees the value in tapping this work force, especially in the health care field. “With the continued explosion in the use of medical records technologies, there are many opportunities for skilled workers, including those with disabilities, to work in this field,” says Still. Matching an underutilized but highly motivated work force with a strategic, urgent need is smart business. And these are good jobs for people especially well suited to them, jobs that provide the employees with vital independence and self-worth. Smart business and good jobs mean real change. The Wisconsin Digital Imaging Project is one key to that change. Christy, founder of Meaningful People, Places & Foods., works for Pathways to Independence on the Wisconsin Digital Imaging Project. 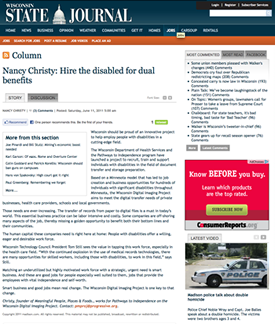 Saturday's guest column by Nancy Christy, "Hire the disabled for dual benefits," scored several points. The economic benefit to employers and the community to be found in hiring people with disabilities, even in cutting-edge fields, seem inarguable. The further point not to be missed is that the employment of disabled workers by the Wisconsin Digital Imaging Project and Christy's own pioneering employment practices at the Wilson Street Grill offer us a rich employment model with broader applications. Need help transferring from paper file to digital storage without killing your budget? It’s unlikely there’s a lawyer today who hasn’t seen the explosion of technology as both blessing and curse. And while digital technology can certainly be a remarkable resource in the hands of a good attorney or firm, it can place new demands on an already daunting daily schedule. Unfortunately, the current political battles in Washington and in Wisconsin over budgets, debts and America's economic future have obscured the fundamental challenges that confront us: job creation and economic recovery. A number of succesful programs match workers with disabilities with needs in local business. Truly diverse communities leave no asset underutilized. When diverse communities take advantage of the contributions of all citizens, they become model communities. 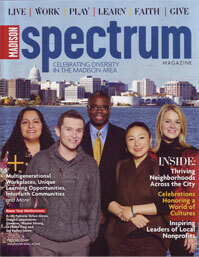 Madison has a plethora of progams, initiatives and organizations dedicated to fully integrating people with disabilities into all aspects of community life, including employment.